Most depth maps for 2D+Depth stereo generation and stereo processing are provided to Nuke as grayscale video sequences with symmetrical RGB channels. This type of format is essential for viewing and is fundamental to depth map representation. But sometimes another color system is used for depth videos: YUV. In YUV color space the main information about the frame is concentrated in the luminosity (Y) channel, whereas data from all thee RGB channels is considered when that color space is used. But when converting YUV content back to RGB, the output channels may turn out asymmetrical. If the depth video contains asymmetrical RGB channels, the resulting depth values displayed in Nuke projects may differ from the initially obtained values. YUVsoft Depth Reader, a part of 2D to 3D Suite, is an auxiliary plugin that converts images or video sequences from YUV to RGB color space and then provides the symmetrical color decomposition to the RGB representation. The Depth.Z channel comprises the Y component of the source video, so the problem of asymmetrical RGB representation is fixed automatically. 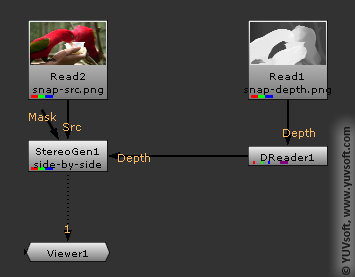 The YUVsoft Depth Reader tool takes the source video as an input and then outputs the Depth.Z channel; the symmetrical RGB video can be also saved. When working with depth maps in Nuke, the Depth Reader node should be added to each depth video containing asymmetrical RGB channels. Stereo Ghost Busting plugin for The Foundry Nuke – hepls to eliminate ghosting effect, caused by problems with the stereo projectors.